Remember that free jar of Biscoff spread I got at the Hot Chocolate 15K Expo? Yep, that’s still coming in handy. Since I loved this peanut butter chocolate chip bread I made in the fall, I wondered… could I replace the peanut butter with Biscoff spread and take out the chocolate chips with the same delicious results? Psssst… rhetorical question. The flavor in this bread sneaks up on you. 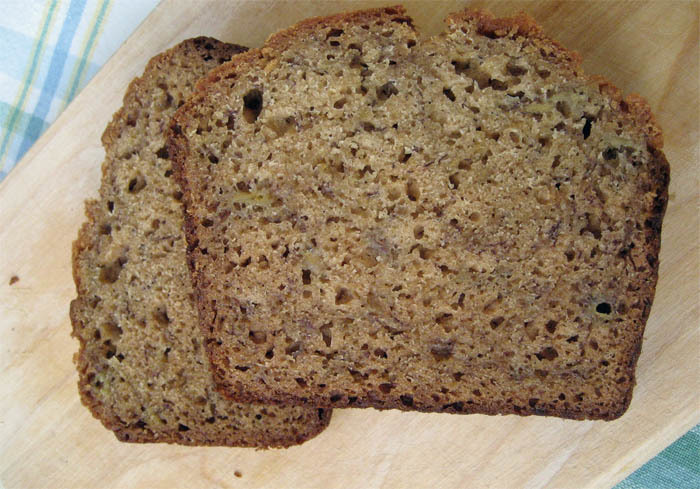 The first bite says ‘this is ok, but I think I like my other banana bread recipe better,” then a couple bites later, your mouth says ‘I think I can taste the Biscoff now’ and then your nose is thinking ‘oh yeah, that’s the Biscoff!’ and the next thing you know, you’ve finished the slice and sort of want to finish the loaf. I like breads with a hard top, not a soft and sticky top. Not crunchy or burnt, but ones with an identifiable thick top – like a muffin. Ha. Muffin top. So, anyway, this bread has a definite hard top to it. Thus, I eat it from the bottom up, saving the best for last. I will say, the end pieces I found to be a little tougher than your average bread. The loaf was a bit drier on the edges than I’m used to, but like that stopped me from eating those two end pieces. It was justified because I didn’t want anyone to take a bite and think the whole loaf was dry, because it certainly was not! 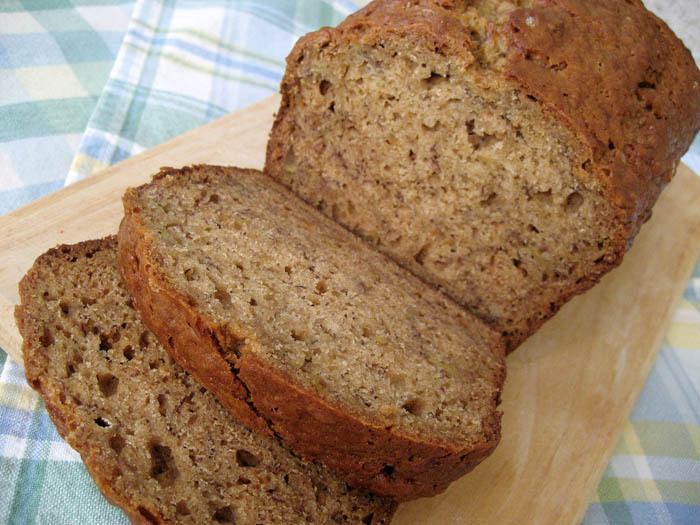 You really can’t compare this bread to your favorite banana bread, because they are two different categories. Like Coke and Vanilla Coke. The addition of the Biscoff gives it an almost caramel flavor. 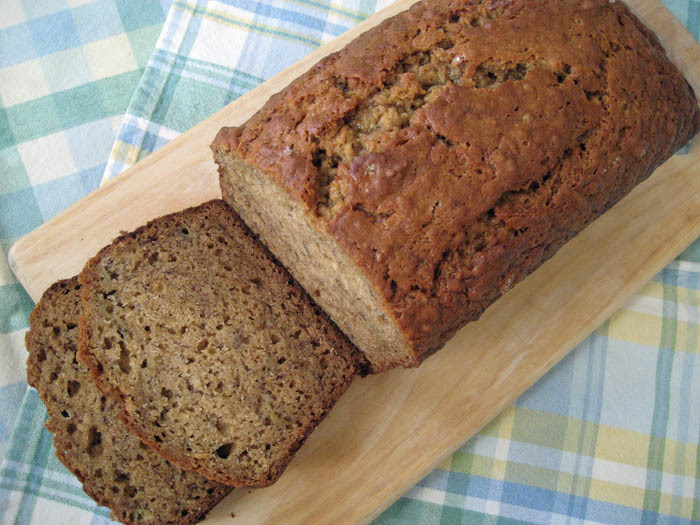 It does give off a much stronger aroma than any other banana bread I’ve made – and I mean that in a good way. I could smell it wherever I went and I wanted more, more, more. This is a very thick and sturdy bread, which makes it good for travel or shipping. Plus, with the Biscoff there will be that je ne sais quoi factor for the lucky recipient. Just tell them the secret ingredient is love. Non-bakers always go for that. Preheat oven to 350 degrees F. Grease an 8×4-inch loaf pan and then line with parchment paper so that it hangs over the two long sides. In a large bowl, whisk together the flour, baking soda and salt; set aside. In a separate large bowl, whisk together the banana, Biscoff, sugars, buttermilk, oil, eggs and vanilla extract until smooth. Pour the wet ingredients into the flour mixture and gently fold together with a rubber spatula until just combined. Transfer batter to the pan and bake until the loaf is golden brown and a toothpick inserted comes out with just a few moist crumbs: 1 hour to 1 hour 15 minutes. If you’re afraid your bread is getting to brown on the top, tent it with a piece of aluminum foil. Allow the bread to cool in the pan for about 10 minutes. Use the parchment paper overhand to lift the bread out of the pan and move to a wire rack to cool. Delicious and very easy to make! I added 1 cue of chopped walnuts for crunch…will definitely make again!